Strive’s Head Office has a stunning space available for meetings, get-togethers, training events, and seminars! The Tonnar Brac e room, named after Strive’s founder, is available for short-term rentals and is over 1,700 Sq./Ft. 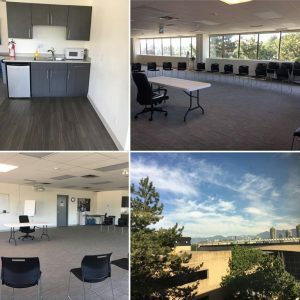 The room has excellent natural light from two directions, a small updated kitchen, a snack vending machine, and an ample supply of tables and chairs. The Tonnar Brace room is located in Burnaby at our Head Office, near BCIT and the Grand Villa Casino, right across from the Delta Hotel. There are plenty of restaurants located nearby: Personas, Starbucks, and Atlas Steak + Fish (just to name a few directly across the street). There is a shuttle bus that runs regularly to and from the nearest Skytrain station. For more information or to reserve the room, please contact Daneille Cabrita, Office Manager, or Sunny Fong, Contract Manager, at our Head Office: 604.936.9944.